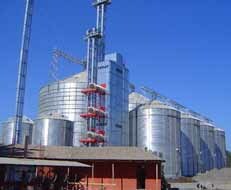 As part of its grain drying program, ABCHansen offers two different types of dryers - namely the Neco Continuous Flow Grain Dryers and the Cedar SCM Hot/Cold Air Type Dryers. heated it starts out with a very low relative humidity, meaning it has the ability to absorb moisture. As the air flows through the grain it absorbs moisture from within the kernel. As the moisture evaporates it cools the kernels much like the cooling effect when moisture is evaporated off you skin in the summer. Because of this evaporative cooling effect, the wetter kernels never approach the temperature of the heated air. As the grain gets drier less evaporation occurs around the kernels and so the grain temperature moves closer to the air temperature. With a typical cross flow dryer (screen dryer), the same grain is next to the heat all the way though the dryer so it gets over dried (thus over heated) while the grain on the other side of the grain column never gets exposed to the hottest air so it is under dried. This can have a devastating effect on grain quality, efficiency, and capacity of the dryer. With a NECO dryer the grain is constantly moving past a series of unique hot air ducts. This grain is constantly moving in and out of the hottest air, so all the grain gets a chance to be exposed equally to the hottest air. Furthermore the gentle mixing and loosening of the grain as it flows around these ducts insures that the grain is dried evenly and that airflow through the grain is increased, enhancing the efficiency and capacity. None of the grain in a NECO dryer is over dried or under dried. 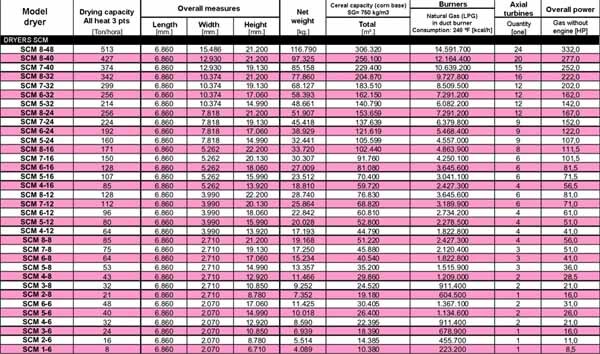 Kernel temperatures in a NECO dryer remain low for all the grain, meaning higher grain quality, better efficiency, no heat-damaged grain, lower stress cracks, and higher test weights. 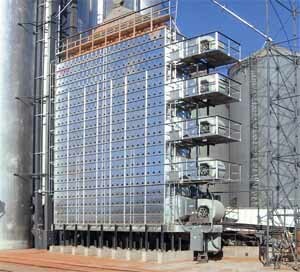 Simply put the NECO grain dryer offers a better way to dry grain! 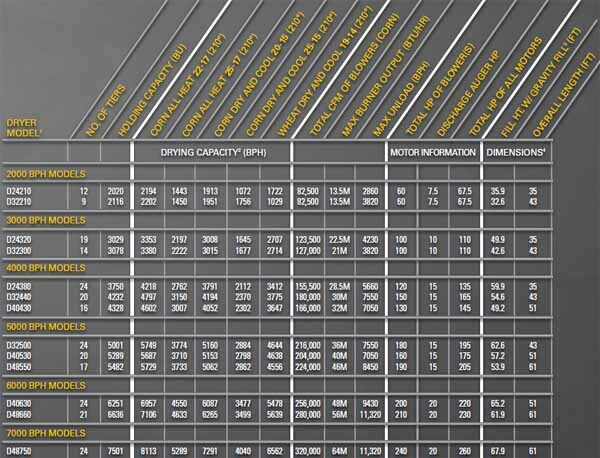 With capacities from 8 Ton/h to 750 Ton/h, basde on 3% reduction. The Cedar dryer has been designed to dry any grain with a high moisture content, in a single pass, using a heat-drying process combined with a dry-aeration system. The dryer is also able to dry and cool the grain during the last stage of the process with the simple flick of a switch, thus obtaining well conditioned grain that is available for immediate marketing - directly from the dryer, if required. 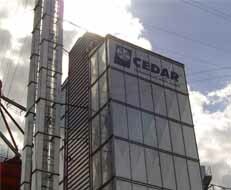 By iIsolating the hot air chamber, and by including the recirculation of cool air, or both these at the same time, CEDAR’s Grains Dryers allow to save between 10% and 25% of fuel consumption when compared to other conventional dryers. Fuel options on these dryers are diesel, parrafin, coal, wood and natural gas/LPG mixtures.All furnaces and combustion parts comply with safety standards.Any of the above mentioned combustion elements can be used as direct or indirect way of heat, for example through heat exchangers in the case of diesel, wood and coal burners. The hot air chamber is covered with a mineral wool blanket to avoid heat loss to the atmosphere. The insulation material is protected from the heated airflow with galvanized sheets riveted and bolted to the structure of the equipment. This insulation has a 10% to 15% of fuel when compared to dryers without insulation. This percentage will vary depending on the drying air temperature and local environmental conditions. 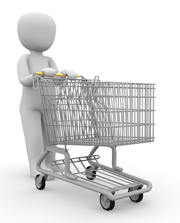 Fire protection consists of sprinkler systems located at different levels in the equipment. They are strategically placed into the columns. The water is fed through individual galvanized pipes. The fire protection system also has a valve which can be opened manually. This silencer is connected directly to the exhaust manifolds of the air purifiers, thus collecting the entire volume of air generated by the axial fans, and therefore absorbs a high percentage of noise caused by the fans. This equipment is made of heat-laminated sheeting. 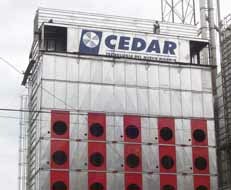 The Cedar dryer is also equipped with high performance sound-absorbing acoustic insulating materials, which also have an auto fire extinction properties.